Here in South Florida, anyone would be hard pressed to find a condominium building without a balcony. And why should we not have them, when there are beautiful views and weather to enjoy year-round? With our beloved tropical climate, there come a few downsides. The high winds, salt water, humidity, and heat combine into a perfect toxic mix to wreak havoc and blemish our much-enjoyed balconies. Specifically, our balcony handrails are constantly under duress and require some much-needed maintenance. You might ask, “What should we, as owners or building managers, look for to know if a balcony railing might need to be inspected, repaired, or replaced?” Thornton Tomasetti is often asked this question, and fortunately, the answers are straightforward. 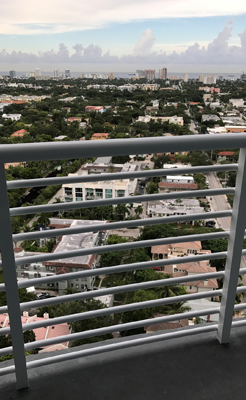 As practicing forensic and structural engineers in South Florida, we are often sought out to assess the safety of balconies as well as prescribe a maintenance or repair procedure and oversee the work. One of the first questions to ask is, does your building fall under the classification of public lodging establishment, and is it three or more stories in height? If 75 percent or more of the units are available for rent to nontransient tenants, or if more than 25 percent of the units are available for rent to transient tenants, then, yes, the building falls under this classification. Transient is defined as a unit rented more than three times in a calendar year for a period of less than 30 days or one calendar month, whichever is less. Nontransient is a unit rented for a period of at least 30 days or one calendar month, whichever is less, and has more than four rental units. 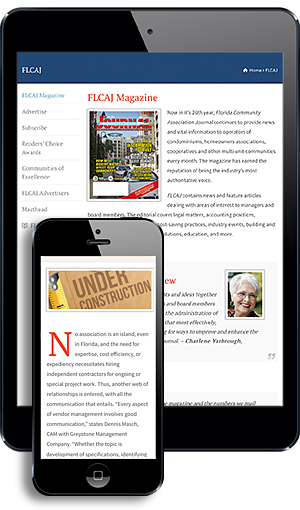 Both must be advertised to the public as places regularly rented to guests (some further exclusions apply to condominiums, and more details can be found in Florida Statutes, Chapter 509, Lodging and Food Service Establishments; Membership Campgrounds). If you answered “yes,” and your building is a public lodging establishment of three or more stories in height, then you are required by the state of Florida to have the balconies inspected, including the handrails, every three years. These inspections are required by Florida Statute Section 509.2112 and Florida Administrative Code Rule 61C-3.001(5)(a). Inspections are to be performed by a “person competent to conduct such inspections.” Generally, this would include an engineer, architect, or general contractor. If you answered “no,” then while the state does not regulate the frequency or the requirement for periodic inspections, having an inspection performed is generally a good practice. Regular inspections of your balcony will not only help keep you and others safe, but they may also save you money in maintenance costs down the road. General signs of deterioration can include loose or unstable railings, shrinkage of sealants or grouts, missing fasteners, and rusted or corroded metals. Things to look for where the handrail is installed into the concrete include cracking, flaking, spalling, staining, or changes in texture or color of the concrete. Spalling is when a fragment detaches from concrete. Once you have identified some of these signs of deterioration, it may be time to ask a professional to evaluate the condition of the handrail system. Depending on the extent of deterioration, the above-mentioned items might not automatically qualify for concern, but they may be a forewarning of maintenance that will be necessary in the future. Maintenance can be as simple as tightening fasteners, cleaning the substrate, resealing, and/or repainting. In a more extreme scenario, it can be as involved as the removal and replacement of the handrail system. However, it is the in-between that will often require a more complex assessment to determine the appropriate course of action. When the strength of the handrail system or anchorage is under question, an engineering analysis or a load test, or both, may be the solution. Recently, we were asked if an existing metal balcony railing had the proper embedment to meet the requirements of the Florida Building Code. After concrete spalling had been identified at the anchorage for some post locations, the safety of the handrail system had come under question. To determine if the railing could be considered safe, we developed a testing protocol that would subject the railing to simulated loading conditions. After testing, we found the railing embedment and anchorage system to be sufficient and to meet the criteria listed in the 2014 FBC. If we had not used the testing protocol, then the capacity of the system would not have been established, and it would have been demolished and replaced. Testing saved both time and money. In summary, if the strength or safety of the handrail system is questioned, load testing and/or an engineering analysis may provide an answer without requiring the removal and replacement. Being proactive with periodic inspections and general upkeep and maintenance can help keep everyone safe and prevent the need for expensive repairs or replacement further down the road. Lauren Millman, Ph.D., P.E., is a Senior Project Director with Thornton Tomasetti. For more information, call (954) 903-9300 or visit www.ThorntonTomasetti.com.